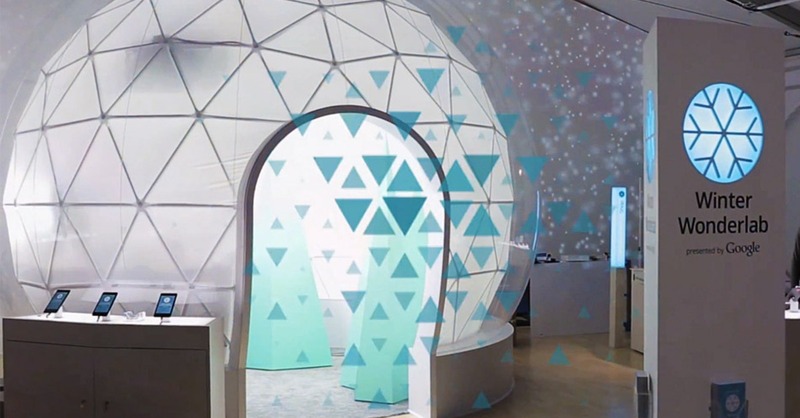 When Google asked Autofuss to create a one of a kind brand experience for the holidays, they wanted us to transcend the traditional retail pop-up and provide shoppers an opportunity to have some fun while getting a broader understanding of Google's products. With this in mind, we created Google Winter Wonderlab as a place where kids and adults could escape the typical holiday shopping experience and enjoy an oasis of entertainment, creativity, and excitement, made possible through the power of the Google. Located in Westfield Malls across the US and in Manhattan’s Bryant Park, these spaces were designed with an open floor plan that allowed guests to enter from all angles. With a cloud based queue system, there were no lines, visitors explored movies, books and games and were notified when it was their turn to experience the Snow Globe. Every fixture was modular and movable allowing us to customize the scene to any location. Each interactive piece represented the essence of winter, from the ice sculpture tables and chairs to the Snow Globe centerpiece. The Snow Globe was the main attraction. 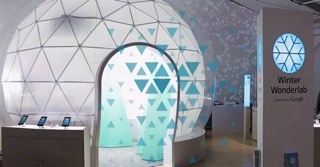 The Slo-Mo Cam allowed each visitor or group of visitors to capture a magical winter experience resulting in a video that was customizable with Google Play music and sharable on Google+ or e-mail. This branded experience allowed Google to be part of a consumer’s holiday experience, providing each visitor a bit of tangible Google magic while at the same time providing them an opportunity learn about the growing family of Google hardware devices and the supporting Google ecosystem.